wow great wiring digging the stealth mode feature. Thank you Hibbert. There's been a few times in the past where i've had to take both my riding jacket an shirt off to cover up the front and rear lights. By doing the stealth mode wiring mod, i can keep all my clothes on and still be incognito. 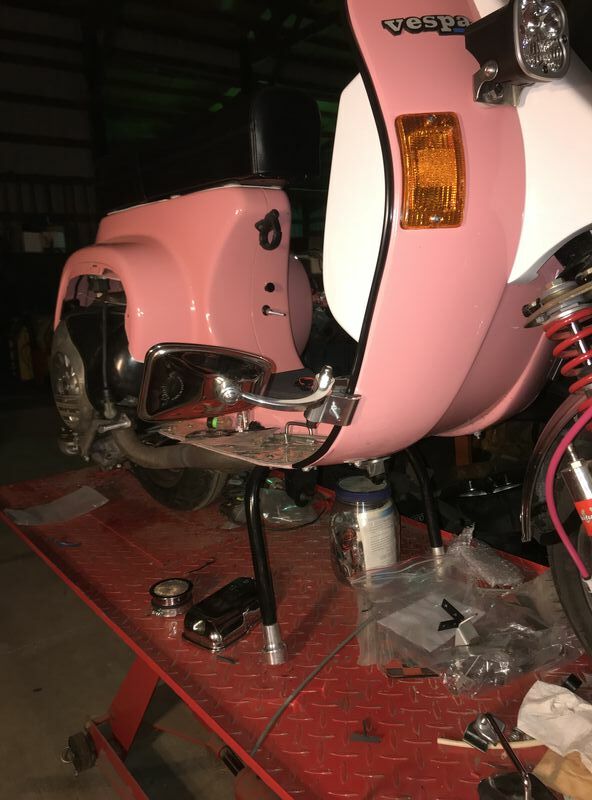 Well, it’s been a few months since I’ve done anything to the PinK bike, so l started up on it again last week. 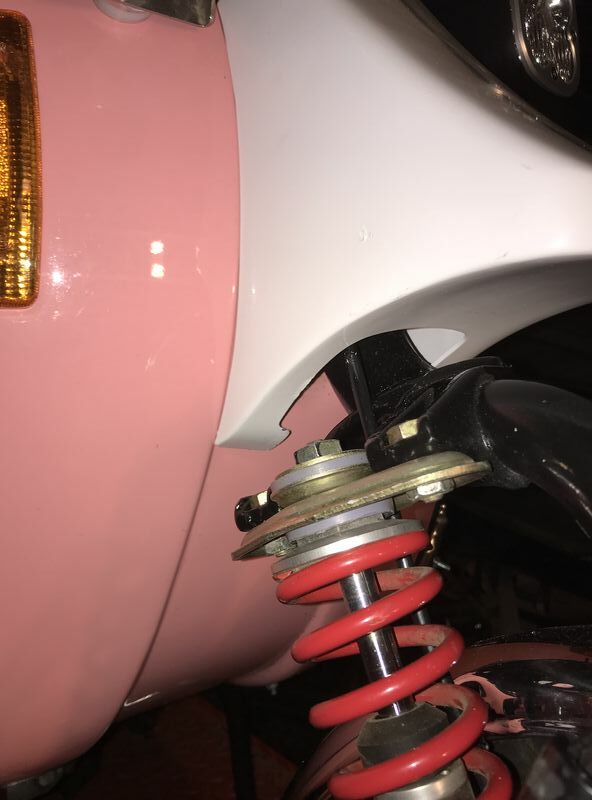 I actually bought the legshield mirrors at the tail end of last summer, but I couldn’t figure out the best way to mount them. I consider the Halcyon Staduim legshield mirrors the best out there. 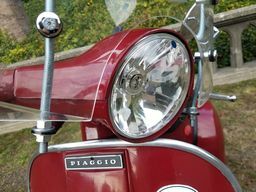 I have them on my lammys (and they fit great), but the way the legshield beading is on the Vespa, they don’t fit that well (if you've ever tried mounting the Stadium mirrors on a vespa, you'll know what I'm talking about). I was trying to figure out a simple yet solid way to attach them, but I couldn’t figure out how...so they’ve been on the back burner for some time. 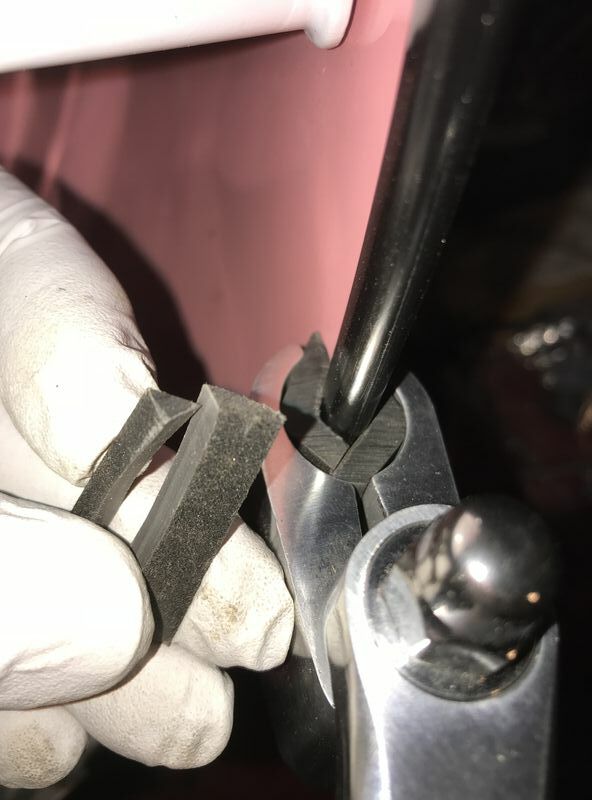 I finally got an epiphany, and trimmed down the hard rubber mounting insert that they come with. They fit perfectly now. If you can afford them, they really are the way to go. 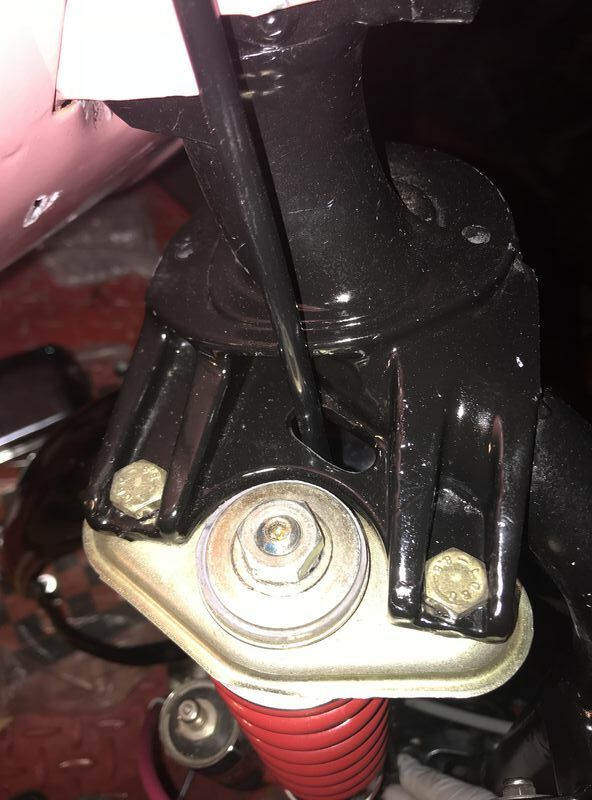 One of the panel latches was missing from the scooter frame when I bought it years ago. They’re fairly difficult to find. I’ve been searching for one for quite some time now. I finally found one on eBay Italy. Since I only needed one, I ordered a second one at the same time. It saved me a few dollars on shipping. So my last option was to install a Trailtech Striker computer. It took a bit of doing to find the best place to run all of the cables. Oh, and I also installed a tach too. I felt like I really didn’t need to, but I had a couple brand new ones in my shop that had won in a raffle. On top of the glove box was just as good of a spot as any to mount it. It took about a week to finally decide how and where to fit and mount the speed sensor. 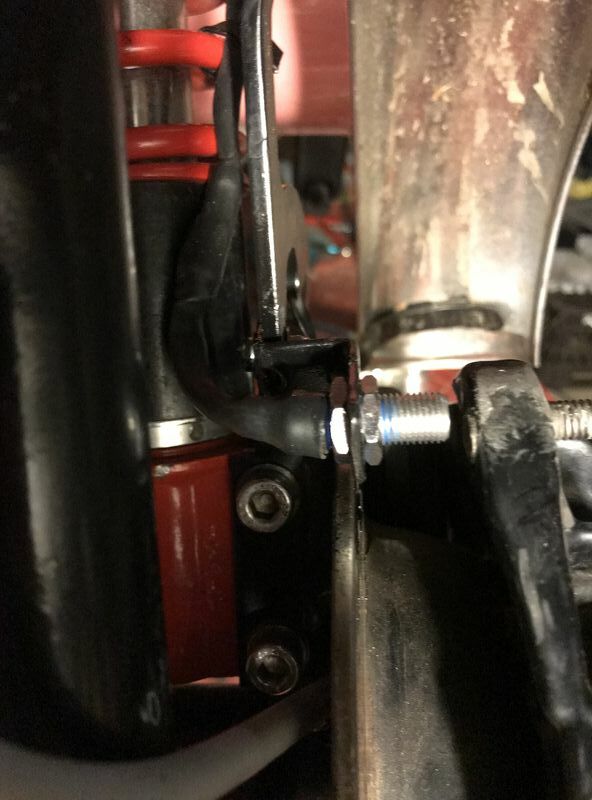 I made a small bracket and mounted it to the mudguard. 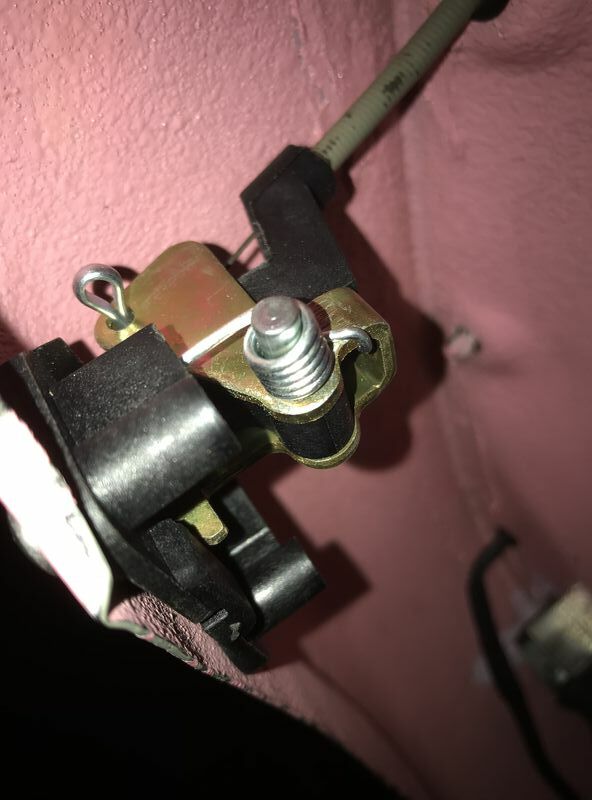 I’ve mounted a TT computer before on a Grimeca 5 star hub that’s on my T5, and it was much more simple. The 20mm disc brake kits have a different design compared to the 16mm that’s on my PK. 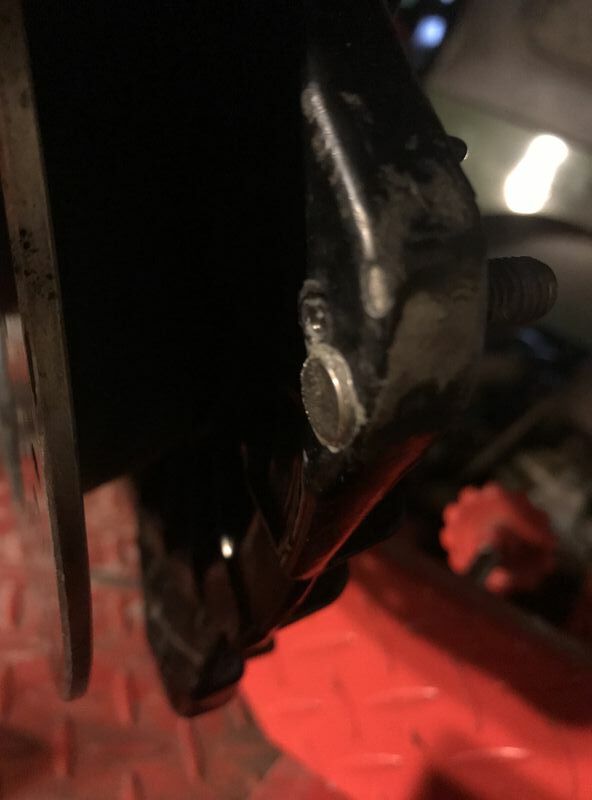 I drilled a hole in the hub (right next to a wheel stud). 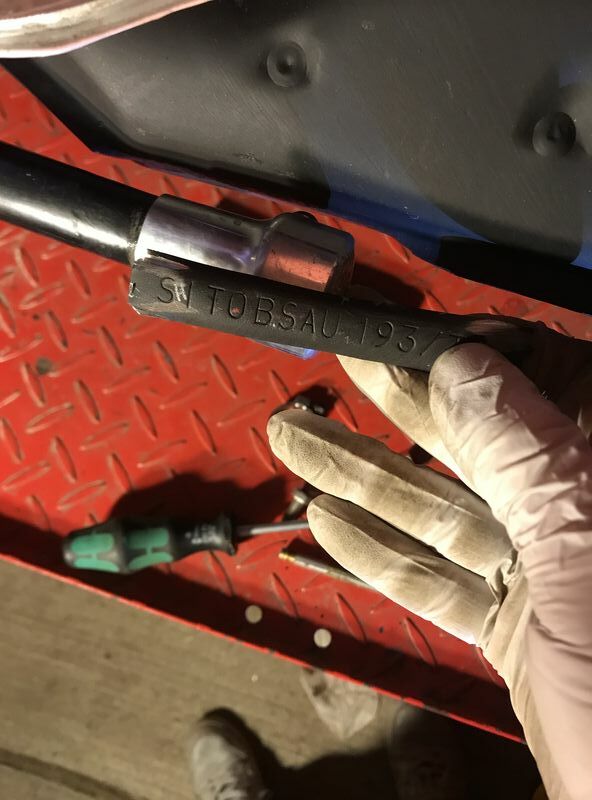 I only went in about 3/16” deep. I epoxied the magnet in there for the speedo pick up. The speedo cable that came with the TT computer has a ridged plastic sheathing over it. I was racking my brain trying to figure out how to route it. I was originally hoping to route it inside the fork tube, but it was looking like that there wasn’t going to be enough room. 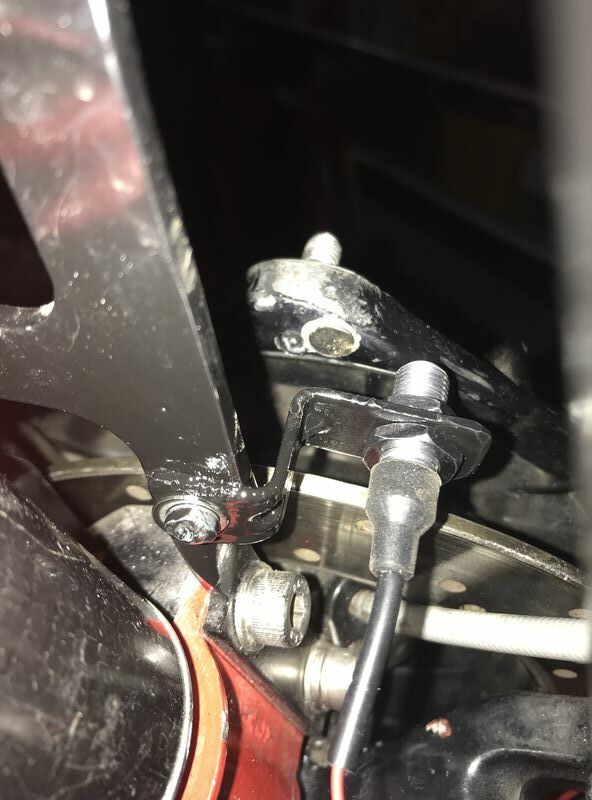 I then decided that only if the cable was going right through the webbing on the fork (at the upper shock mount plate), that I could make it work. So I milled out an oval slot for the cable to pass through. With the cable going though the webbing, it makes it so that the cable fits under the horncover without rubbing or kinking it. I also wanted a screen that would cover the airbox intake, but I didn’t want to disrupt the air flow too much. I found a low profile filter in my shop that I could make fit. It had a gauze filter that I was try to figure out how to remove. I finally gave it a blast of starting fluid and lit it with a propane torch. It burned all of the gauze out, and left the metal stainless steel screen intact. I didn’t quite like the button head fastener that I was using in the storage tray. All the other holes that are used for mounting the storage tray to the frame I countersunk so that I could use a flat head bolt. 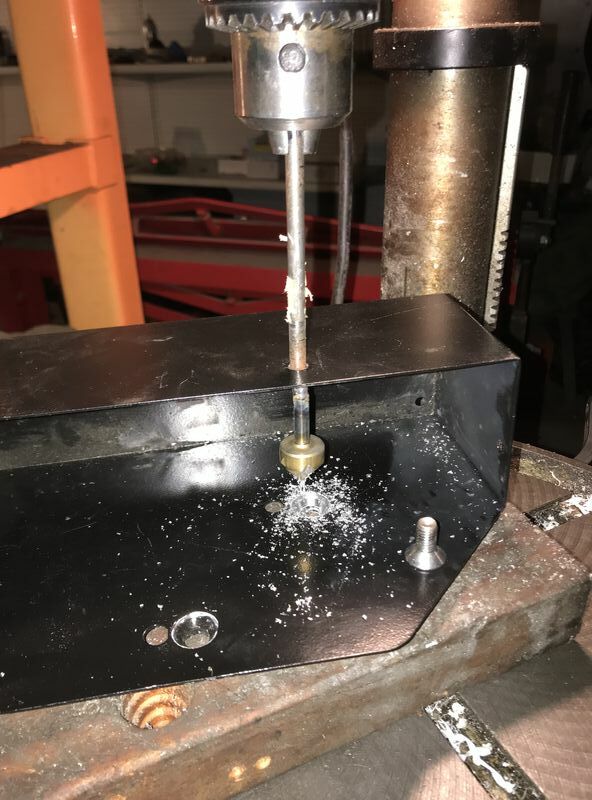 I didn’t want to drill a huge 1” diameter hole in order to fit the countersink bit through, so I ended up welding a 1/4” rod to the end of my countersink bit. It worked like a charm. When I had finished drilling, All I had to do was cut the rod back off the bit! No harm, no foul. I needed to calibrate the TrailTech speedometer with a GPS. 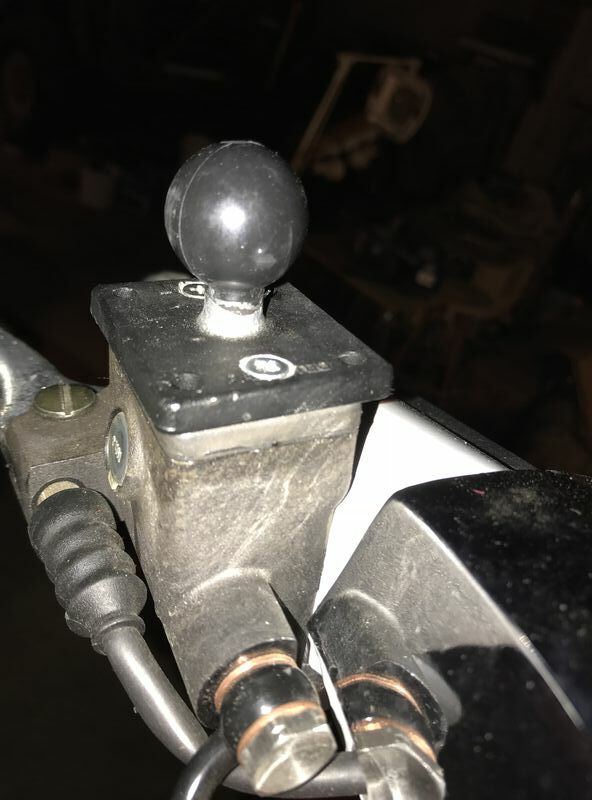 Since I couldn’t find a Ram Ball mount that will fit the Grimeca brake master cylinder, I simply found a spare Ram Ball plate in my shop, and drilled a couple holes through it. The Grimeca M/C cover gets sandwiched between the M/C and the Ram Ball plate. It was a very simple mod. 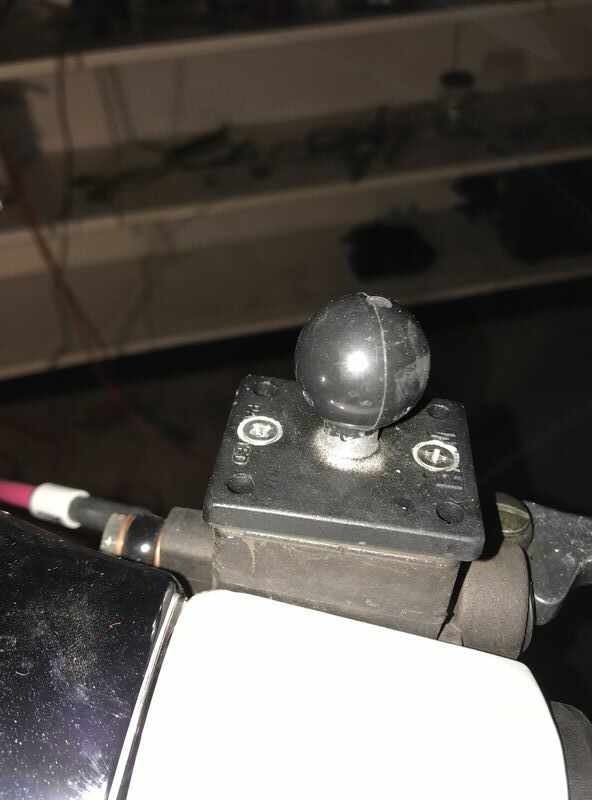 But if anyone knows of an actual Ball mount that is designed for the Grimeca M/C, please let me know. I’d like a setup that’s a little bit cleaner. It worked great for comparing the the GPS against the digital Trailtech speedo. 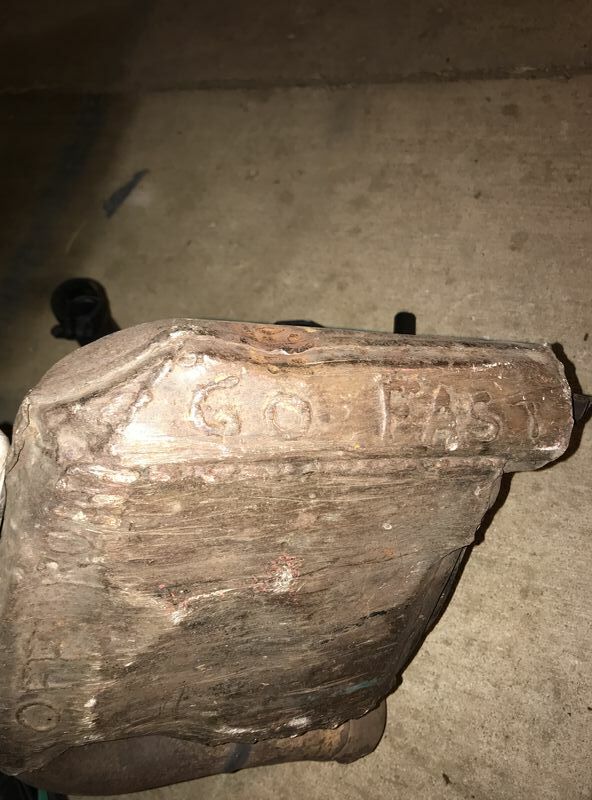 When the GPS says I’m going 55mph, the Trailtech reads 55.5mph. I think that’s good enough for me. 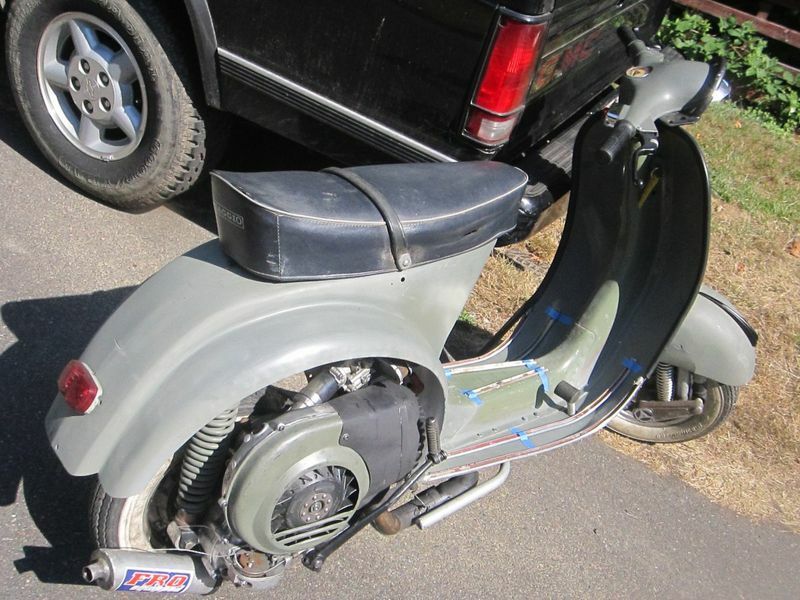 It's been two years so any chance we can see some photos of the entire scooter. I would love to see the back, front and side to side of this amazing project. It's been two years so any chance we can see some photos of the entire scooter in the picture frame. I would love to see what the back, front and side to side of this amazing project. Thank you for the compliment Rowdy! I guess I have been a little bit secretive by not posting up a "full body" shot. I also had no idea that it's been about 2 years! Oi! I was kinda hoping to finish the whole thing before posting it up in all of it's pink glory, but 2 years is a long time to wait for sure. The main reason why I haven't taken any good pics, is because I have absolutely horrible lighting in my shop right now. Any pictures that I would take would be super grainy. The couple times that I've done a "hot lap" on it for testing, it's gone right back into the dark shop and back onto the lift table. And me being me, I keep forgetting to take a picture when I had the bike outside. 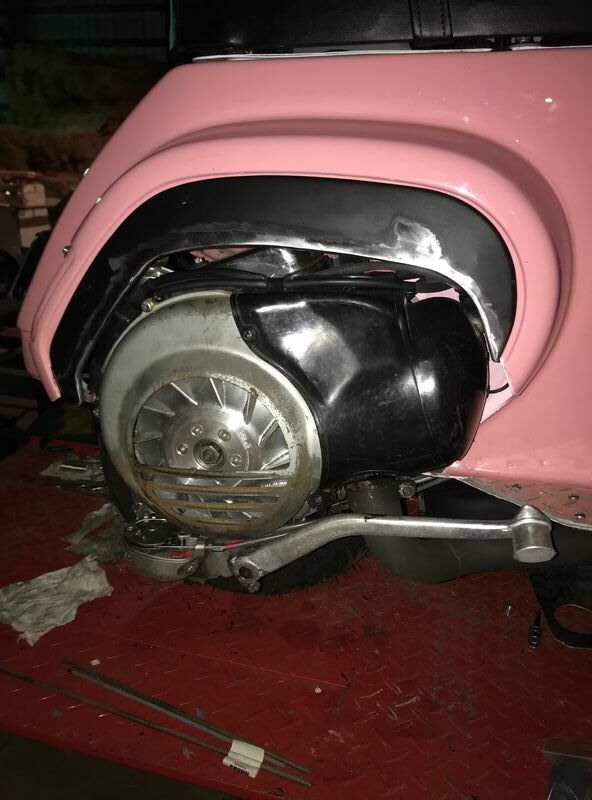 Though I think the project is coming closer to an end (I was kinda setting Valentine's Day as a goal to have it finished), but there are a few more things that I want to get sorted...one of those is to mount part of an engine side cowl back on it. I've started on it some, but I'm not sure just how far I want to go with the details on the engine side cowl. 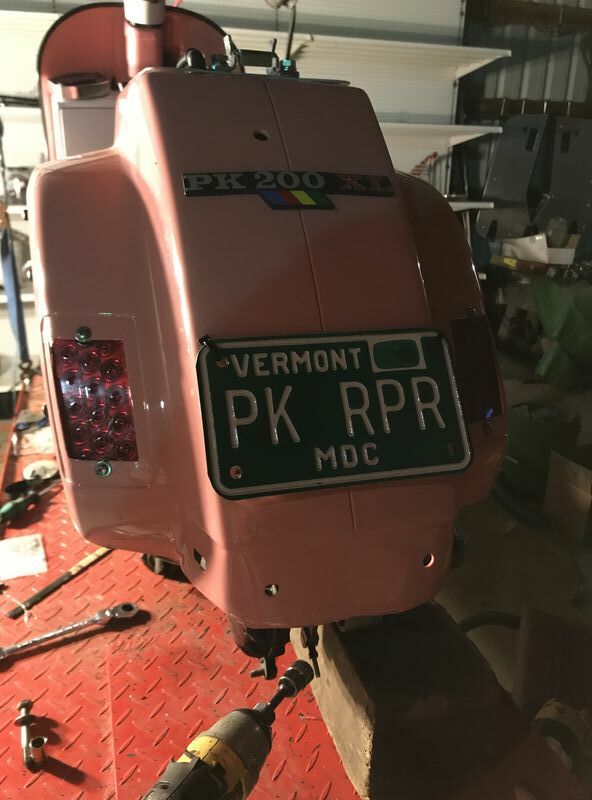 I also bought some decals that go with my new custom Vermont license plate. I will only give one clue for now...think where vintage PK Vespa meets a certain particular vintage BMX bike brand from the '80's. Can anyone guess? It's actually what I coined the name of this unnamed project that I've been working on for so long. I will only give one clue for now...think where vintage PK Vespa meets a certain particular vintage BMX bike brand from the '80's. Can anyone guess? It's actually what I coined the name of this unnamed project that I've been working on for so long. DK SOB was a BMX brand. I guess that would work. btw, wasn't that air filter gauze just like the one that sdjohn had all that trouble with? I wasn't aware that sdjohn had issues with this kind of air filter. 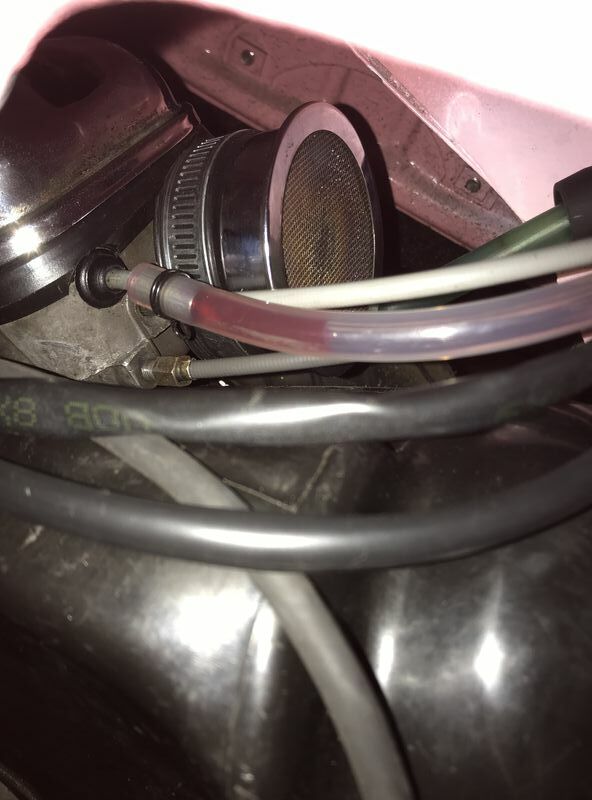 Funny thing you mentions it though...the reason i had this air filter in my shop was because i was having trouble with it when i had it on my tuned up T5. No matter what i did, i couldn't get the engine to run correctly with that dang filter. The filter does seem to work ok on this engine though, but only because i removed all of the gauzing filter out of it. I'm just using the filter as a metal screen to keep the larger chunks out of the air box. Now it looks like I need to post up a few pics tonight to prove it. There is a picture of what looks just like yours. Better off with a regular sponge filter. If it was Making a T5 and a 221 run bad it won't be helping the PK200 either. Yes, that looks to be the same filter. I'm using the stock air filter on the PK200, but since i wasn't using any sort of an air bellows, there was a bunch of road film and other junk getting inside of the carb box. I was thinking about using a sponge type filter (Uni-filter), but i didn't want to have two air filters at the same time. I wanted to have some sort of a high flow metal screen over the intake, and that garbage of an air filter is what i had. Once i removed the guaze from it, it flows quite well. But when used on a larger aftermarket carb, i think they're rubbish. and here’s a picture of the plate. I got it about a year ago. By doing that, I was kind of committed to finishing the project. 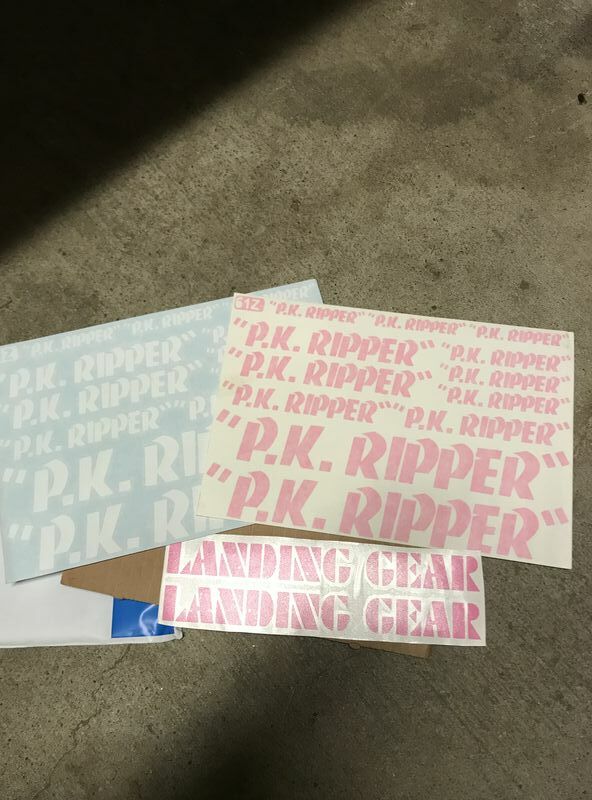 And here is a picture of the stickers that I found online. 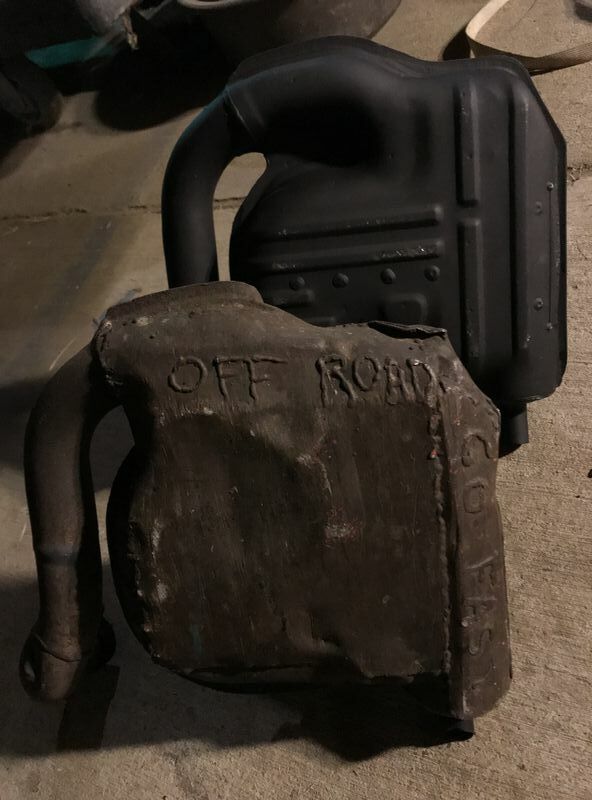 I somewhat needed a new muffler, so I bought another Sito+. The old Sito that was on there literally had hundreds of off-road miles on it. And I’m not talking gravel roads, but actual dirt bike trails. When I bought the original Sito+ new, I welded a 1/8” thick skid plate across the entire bottom and up the sides. 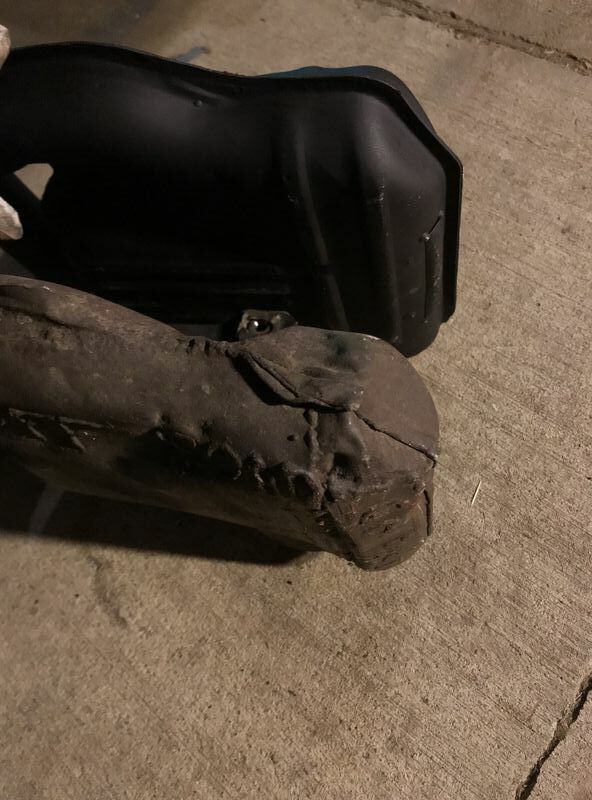 Even after armoring up the muffler, it got absolutely beat up big time! It’s quite amazing that the muffler still seemed to work just fine. The Sito brand is well know for its exceptional fit and finish...one you do a little addition work to it. 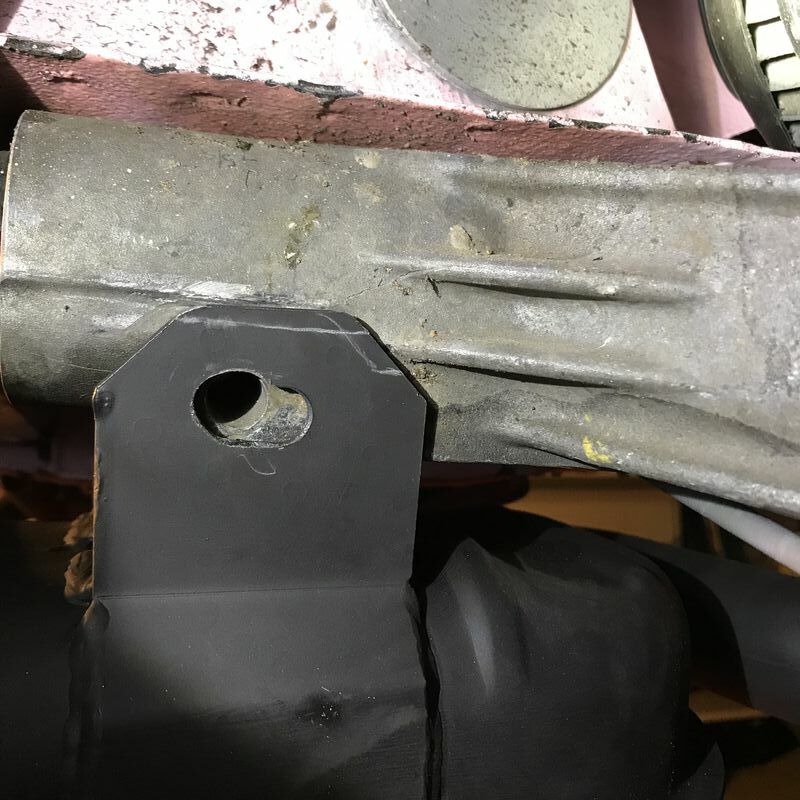 I had to remove the tag because I needed to peen over the pinch weld in the muffler. It needed to be done because the centerstand leg wouldn’t fold up past it. I finally started on doing something with the flywheel side cowl. Ideally I’d like to have fabbed up a full cover for it, but I thought that it might look peculiar (ok, ok, the whole scooter looks peculiar) with the amount of the the body that I had to cut away to make the cylinder shroud fit. So I decided to cut down the cowl instead. I bought one from SIP (it’s kind of a poor fit), so I don’t mind cutting it up. 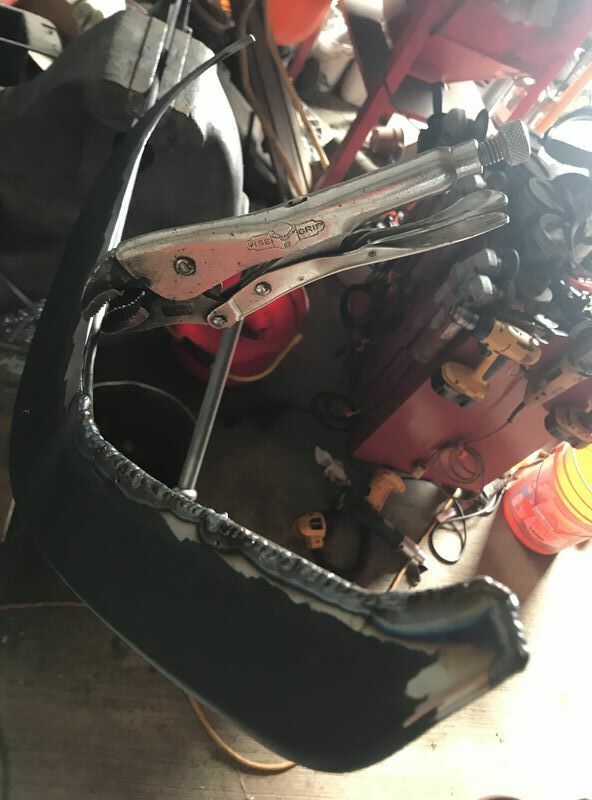 I welded a 1/4” rod around the area that I cut out. The reasons being is because it provides structure to the cowl, and I always go by the philosophy of “no sharp edges” on anything I build. 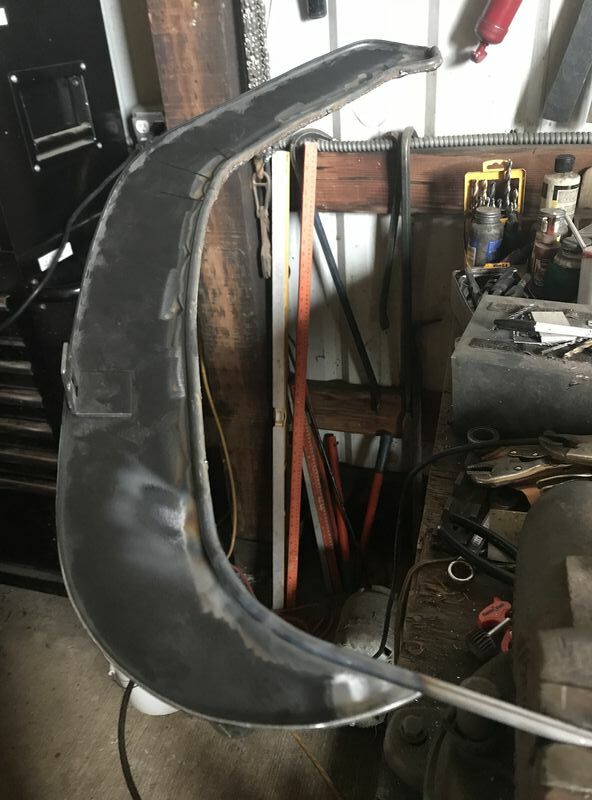 What the backside looks like once it was welded. I used a torch to heat up the 1/4” rod so that I could easily bend it. this is what the front side of the cowl looks like after it was welded. And this is what the panel looks like after I sanded it down with a flapper wheel and a scotchbright disc. 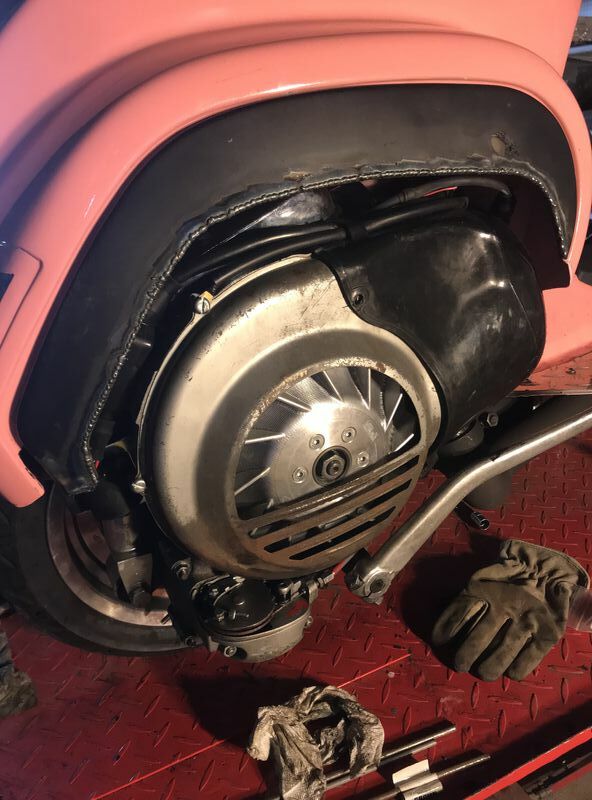 Well done on that engine "door", reminds me a little of my own 98% done project - Nekkid motor FTW! The couple times that I've done a "hot lap" on it for testing, it's gone right back into the dark shop and back onto the lift table. And me being me, I keep forgetting to take a picture when I had the bike outside. Ok, I've reserved the date on my calendar. This is building up to an exciting climax conclusion! Now then, how about tell us more about this "hot lap" business? Hey whodats, that cowl work is killer. Really enjoying this build ... some serious fabrication skills and attention to detail on display throughout. Looking forward to the end result brother! That green smally looks pretty cool Voodoo! It also looks like your motor is "warmed over" a little bit as well? I might have been a little bit premature about Valentines Day as my completion date. I looked at the calendar, and VD is is less than a week away (I guess me being single means that i really don't have a need to pay attention to some certain holidays). I still need to paint the side cowls, and that ain't happening when it's snowing out. Maybe i should change my goal just a smidge...how about if i get some full body shots of the scooter posted up instead? It's more or less close to being finished. I still need to figure out how to attach the cutdown cowl to the frame (i ordered up a couple Dzus fasteners)...and maybe a few other things as well. As for the hot lap... https://en.wikipedia.org/wiki/Hot_lap I live in a very hilly rural area with lots of twisties (and gravel roads). So whenever i need to do any road testing, i take a "hot lap" around the mountain to see how well the scoot is running or handling. I have a few different "courses" that i'll take depending upon what mods i've done. Sometimes it's multiple acceleration tests, high speed brake check tests, testing new tire compounds in the twisties or for "scrubing" them in the gravel roads, late night headlight adjustment aiming, and other similar things. Thanks Guy! 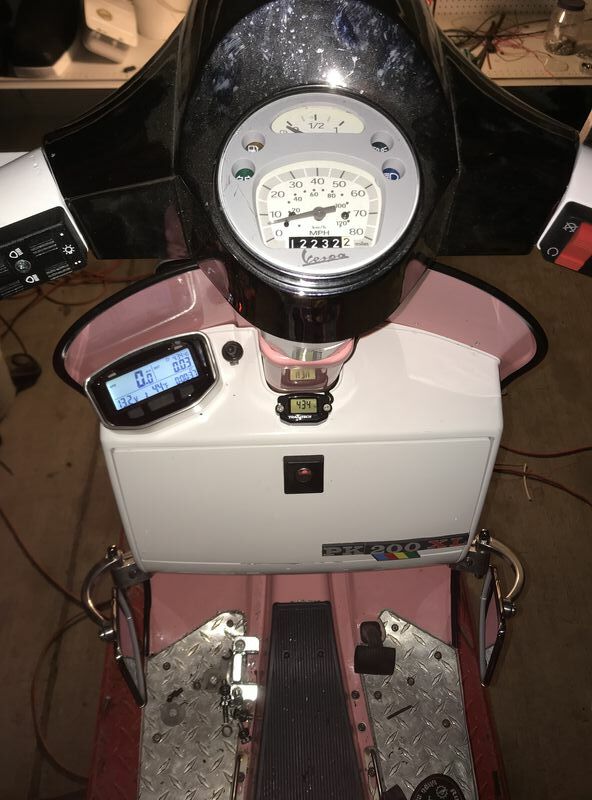 This has definitely been my most favorite scooter project to date. Probably because i haven't had to stick to any sort of rules. I have had complete free reign to create whatever i wanted to on this one. Some of the goals were; #1- to have it handle better than my P200 track bike (which has a fairly severe bent frame), #2- make it looks cute, goofy, and cool enough at the same time that it makes 90% of the people who see it laugh or smile and the other 10% shake their head at it, #3- use up as many spare parts that i had on the shelf to bring new life to an an unused frame.